The bursary offers the successful applicant a fund of €10,000 towards the cost of production for a 10-12 minute short film. 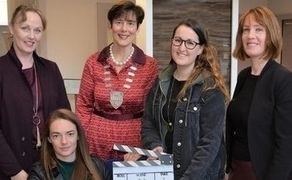 The Bursary is funded through Kerry County Council with support from the Arts Council and is intended to foster talent, creativity, and activity in filmmaking within the county. Filmmakers will also be supported through the Kerry ETB national digital skills centre based in Tralee. This year, a new and separate Script Development fund of €2,000 in total will be available to mentor shortlisted scripts with the potential for further script development. Kerry ETB Film Development Officer, Siobhan O’Sullivan outlined “the importance of funds such as this to develop the industry within the county and to encourage a culture of filmmaking at local level”, while Kerry County Council Arts Officer, Kate Kennelly, described these funds as “an important way to encourage & support filmmaking talent”. Scripts for a drama shoot of 10-12 minutes will be accepted. Applicants should have some experience in filmmaking and be able to prove that a director and/or a producer has seen the script and has a sense of its suitability to go into production. Applicants must shoot on location in Kerry but do not have to be from Kerry to apply. The Kerry Film Office, based in Kerry ETB Tralee, will offer location support and guidance as requested, especially in relation to accessing locations and local resources. There is a two-stage selection process in the open competition. Stage one involves a shortlisting from applications received, while stage two requires an interview in Kerry. The closing date for receipt of applications is set at 5 pm on Tues 30th April.